Environmental Education and the Next Generation Science Standards! 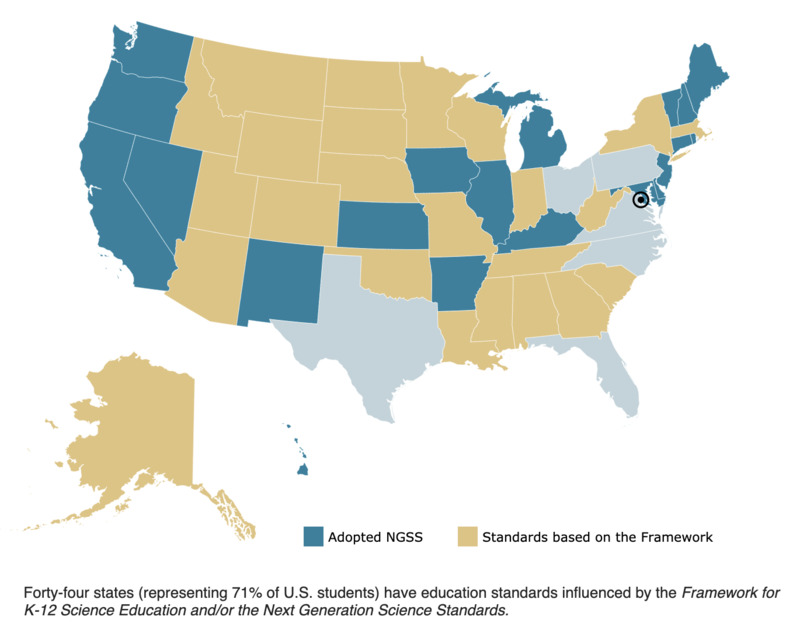 About the Next Generation Science Standards (NGSS). The NGSS represent a significant shift in teaching and learning — a shift from memorizing and recalling facts to focusing on thinking, meaning making, and deep conceptual understanding. We think this is great! These new standards have been adopted by 17 states and the District of Columbia and have influenced dozens of other state standards. It’s also not an accident that the Next Generation Science Standards and Common Core State Standards for English Language Arts and Mathematics fit together like pieces of a puzzle with the goal of providing students with coherent, engaging and enriching learning experiences across all topics. Teaching in Three Dimensions. The NGSS advocates for “three-dimensional instruction.” To experience three-dimensional learning, students need to engage in science and engineering practices in order to learn important science concepts (disciplinary core ideas) and make connections to the unifying themes across science disciplines (crosscutting concepts). Science practices are what scientists do, crosscutting concepts are the thinking tools scientists use to make sense out of what they are learning, and disciplinary core ideas are what scientists know. The performance expectations called for in the NGSS, require students to combine these three dimensions to demonstrate their understanding of science. In simple terms, students should use the tools of science to explore and investigate phenomena, in order to try to figure out how the natural world works. The Opportunity. The broad adoption and implementation of the NGSS is good news for environmental education programs. Reason one: the standards include several performance expectations (across all grade levels) that emphasize understanding humans’ impact on Earth and explaining the complex interactions among all living things and the environment. Reason two: there are disciplinary core ideas, crosscutting concepts and scientific practices described in NGSS that are more effectively addressed through extended investigations and direct exploration of the natural world, i.e.,outdoor science field experiences, than they are in the classroom. Outdoor science programs can actively position themselves as an essential element of NGSS implementation. This is an unprecedented opportunity to advocate for the increasing relevance- the necessity, even- of environmental education, and the role it can play in supporting national goals to improve formal science education. Not enough time for Science instruction in the classroom. According to Dorph, Shields, Tiffany-Morales, Hartry, & McCaffrey (2011), students in California receive an average of 45 minutes of science instruction per week. Given that average, you can think of a four-hour-long outdoor science experience as the equivalent of four weeks of what students receive in school. In two days of outdoor education, two four-hour science experiences would be the equivalent of eight weeks of classroom science. How many weeks worth of science instruction is your program providing? This is a strong selling point for outdoor science programs when communicating with schools. The Challenge. Rising to the challenge of supporting the vision of NGSS requires significant preparation and focused effort. To support the vision of NGSS, outdoor science programs must create learning experiences in which students engage in science and engineering practices and apply crosscutting concepts in order to learn science ideas. Creating such learning experiences is a complex and challenging process, and developing program-wide approaches for creating outdoor experiences that align with the vision of NGSS requires specialized staff training and adequate collaborative time to make changes to (or to create new) curriculum. Of the three dimensions, the emphasis on students engaging in science practices is the most different from former standards, and is inspiring significant changes in instruction throughout the science education community. Students can more readily engage in certain science practices outdoors than in classrooms. To show how this can be done, selected BEETLES student activities feature the practices of: Asking Questions, Constructing Explanations, Engaging in Argument from Evidence, and Planning and Carrying out Investigations. In a classroom, a really great life science activity might involve observing a “bug in a cup” provided by the teacher. But in the outdoors, students are surrounded by a vast array of phenomena to explore, which naturally inspires scientific questions and exploration. Each organism or natural item is a “nature mystery,” and students love coming up with explanations, and discussing different interpretations of their evidence and observations. Given enough time, along with appropriate structures and investigative tools, students’ questions and tentative explanations can be explored and investigated directly while learning outdoors. These big ideas represent thinking tools that scientists use to make sense of the world in any branch of science. Students can use them to understand new phenomena from a scientific point of view. Out of the seven crosscutting concepts listed in the NGSS, we think the following are particularly useful for outdoor science instruction: Patterns, Cause and Effect, Systems and System Models, Energy and Matter: Flows, cycles and Conservation, and Structure and Function. These unifying themes in science can be woven throughout outdoor education programs, where students can gain an appreciation for how to apply these powerful thinking tools to making sense of a variety of phenomena. These are the core science concepts that all students need to understand in order to be science literate. In past standards, most of the focus was placed on learning specific concepts. There were so many facts students were supposed to know at each grade level, that instructors often had to superficially “cover” those facts without taking time for deeper learning. Students were often pressured to memorize and recall those facts on tests. In NGSS, the number of disciplinary core ideas has been cut back significantly, and the emphasis is on teaching for comprehension of core ideas- not just memory of them. Performance expectations are examples of things students should be able to do, after engaging in multiple learning experiences or long-term instructional units, to demonstrate their understanding of important core ideas and science practices, as well as their ability to apply crosscutting concepts. They don’t represent a “curriculum” to be taught to students, and shouldn’t be the focus of outdoor science curriculum development. They’re summative learning goals to work towards. K-ESS3-3: Communicate solutions that will reduce the impact of humans on the land, water, air and/or other living things in the local environment. 4-ESS3-1: Obtain and combine information to describe that energy and fuels are derived from natural resources, and their uses affect the environment. 5-ESS3-1: Obtain and combine information about ways individual communities use science ideas to protect Earth’s resources and environment. MS-ESS3-3: Apply scientific principles to design a method for monitoring and minimizing human impact on the environment. Read the Framework for K-12 Science Education from which the NGSS were designed. Read the official NGSS documents, especially including the Appendices. Learn how to advocate for STEM and Environmental Literacy by using the LCAP STEM Toolkit to influence your (California) school district’s Local Control Accountability Plan. Review the NGSS information and resources available through the Lawrence Hall of Science. Learn about how BEETLES can provide customized NGSS support to your program or school.